Flavia J10NBK Fusion Drinks Station. The All-in-One Beverage Machine. 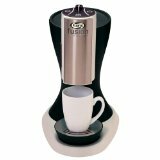 Flavia J10NBK Fusion Drinks Station provides single serve drinks from coffee, tea and over 30 drinks in all. Flavia incorporates a unique brew by the pack system with the Flavia filterpacks. This method is unique in that it doesn't require any messy brewing and virtually no cleaning up after brewing. Don't worry about not being able to get your tall travel mug under the spout either. This unit has an adjustable height to accommodate almost any size cup you can imagine. Has a charcoal water filter and a large capacity removable water tank. The large size makes for fewer fillings, and being removable for easy cleaning. Weighs approx. 13 pounds and measures 14.2 x 10.8 x 15.8 inches. Flavia offers over 30 drinks that will please just about anyone; coffee, tea, chococcinos, cappuccino, or healthy drinks. Whatever suits your individual taste buds. Majority of customer reviews were favorable for the J10NBK Fusion Drinks Station. Most state that it makes a great tasting cup of coffee with little mess or clean-up required. One of the drawbacks is that the Flavia brew packs are carried by very few retailers, including those online. However, you can order direct from Flavia. Some customers mentioned that the machine is somewhat noisy, but it only lasts for about 15 seconds. You will need to remove the drip tray for most travel mugs to fit. This is explained in the manual, but most people don't read thru them. With this unit it is recommended that you DO read the manual, however. One of the major advantages of the Flavia J10NBK Fusion Drinks Station is that with the unique pack system of brewing you get virtually no carryover of taste from previous brewing. Plus, this system makes for a very simple method of brewing, just put the packet in the hold, close the lid, push the button, and 30 seconds later you have your drink, open the lid and remove the empty packet. No cleaning needed in between brews and still no carryover taste from the last brew. Better even than k-cups or pods. The Flavia J10NBK Fusion Drinks Station is more than just a coffee maker, it is a combination coffee, tea, cappuccino, espresso, latte, and hot chocolate machine all-in-one. No need to go out and buy several different machines. Just this one will do.